At just $2100 for the body, the Canon EOS 6D it's the cheapest full-frame camera you can buy new. It's got one hell of a lineage, but how will it measure up to Nikon's crazy new D600, which the same price for body alone? The Canon EOS 6D—Canon's new entry-level full-frame DSLR—looks a whole lot like a slightly beefed up version of the legendary 5D Mark II. That shouldn't be surprising. That camera almost single-handedly turned the professional SLR into a standard-issue tool for filmmakers. The new 6D, jumps into the role the 5DMKII has played since the release of the 5D Mark III six months ago; a professional camera that's $1400 cheaper than the next step up. We're also learning about the 6D just a week after Nikon showed us its D600, an enthusiast friendly, 24-megapixel, full-frame DSLR that costs $2300 for the body. These two cameras will be duking it out for the love of the next generation. So what's inside the 6D? A 20.2-megapixel 35mm sensor, the newish Canon Digic 5+ image processor, and an 11-point autofocus system. None of those specs should be all that surprising. The sensor's resolution falls more or less in line with the 5D Mark II's and everything from the image processing to the 4.5 fps max continuous shooting speed are specs we've seen before. 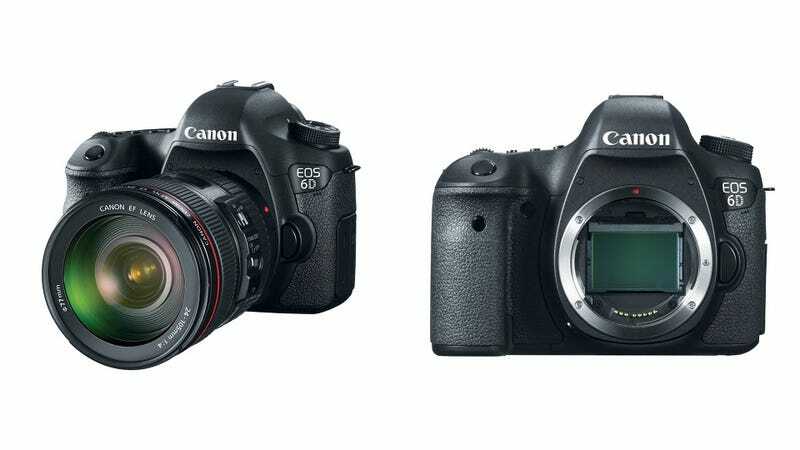 Here's a nice touch, though: the 6D has identical video shooting modes to the 5D Mark III. The 6D can record 1920 x 1080 HD video at 25 and 30 fps or 1280 x 720 HD video at 60 and 50 fps. But unlike other pro-grade DSLRs, the new 6D comes with built-in Wi-Fi and GPS. Other DSLRs require external accessories to get these functions so if it's something you're looking for, the 6D could save you even more money. When the GPS is turned on it adds geographic and UTC time information to the EXIF data of your photos. As with other Wi-FI cameras, the 6D can use it's connectivity to transfer files to your other devices as well as to post the photos online to social networks or Canon's proprietary storage locker service. The concern with built-in connectivity is always that it'll eat up buckets of battery, so we'll be keeping an eye on that when the 6D comes out.